What's this got to do with Scottish salmon fishing you may ask so here's your salmon fishing soothsayer's advice. At this time of year as we get closer to the start of a brand new River Tay salmon fishing season and to mid March there's a mainly unnoticed and at best 'lightly' fished for historical run of perfect heavyweight 'beasts' that appear in the Tay en route to their Loch Tay retreat. Now it just so happens my birthday falls on the 15th of March so carefully take on board what I'm about to state. If you truly are searching for a Tay heavyweight specimen encounter my money is on the period between mid February and the end of March as some absolute 'clunkers' are guaranteed to be slowly making there way up river in the high cold river water and you can take that information to the bank! The fact that there's not a great deal of rod pressure on the Tay during these early spring months compared to the later 'fair weathered' months of April & May shouldn't deter you from getting out into the most perfect time zone for a heavyweight encounter with exactly what made the Tay famous. On a personal observational basis mid March always saw a turning point in general salmon numbers in the Tay too probably due to the fact that the river temperature would be getting closer to the North Sea's typical 42 degrees encouraging more salmon to make a run for it! Now's the time to get focussed on not what happened to old Julius Caesar but on the fact there will be some seriously good looking 'scale perfect' big beasties floating in and out of the Tay's estuary tidal waters between Dundee & Perth slowly making their adjustments back to being able to handle fresh cold river water and one of which could be destined for your fly or lure. 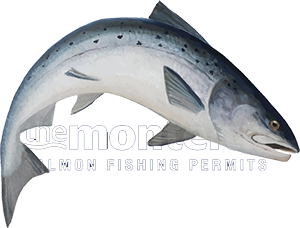 If you're looking for a real 'big fish' highlight during your 2018 River Tay salmon fishing season then the above specified early Spring period is top of the pile for achieving just that. Invest in a 'proven' Mountain Rescue Buffalo Mountain Shirt and simply unzip the oxters and sides when even on the coldest north wind assisted March day you'll likely feel too warm! These clever self insulating tops should be worn with no under garments and even when they get wet externally they will 'well and truly' lock your body heat in. A good grade tweed cap and a light shell waterproof and you've completed your big fish early Spring 'battle dress' check list! I often wonder if the lack of early Scottish salmon fishers is due to them getting cold which is going to happen when most lesser garments are worn. Preparedness of fishing kit is vital too as is making sure you've changed your spinning reel line or have a new strong leader on your fly line as a loch Tay bound Spring beast will easily identify any fishing tackle weak points!